Originally the plan was to go to Mercer Kitchen for a restaurant week lunch, but while skimming through the other participating restaurants located in Soho, I noticed that Lure Fishbar had a menu that offers tuna tartare, grilled salmon, and delicious sounding desserts. After then reading some great reviews of the place, I decided I should try something new. Two of us met up a little after noon last Friday, and there were only 3 or 4 tables with guests when we walked in. 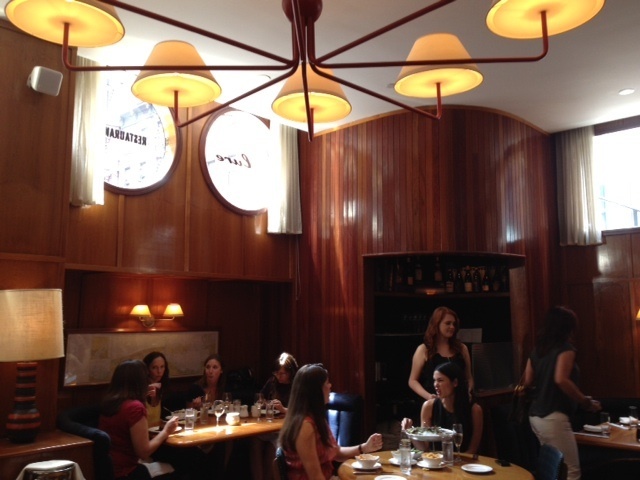 The restaurant is located on the basement level, but because of several windows on both the Prince and Mercer sides of the restaurant, there is plenty of sunlight in the dining room. With the round windows, white ceilings, and wooden walls and trims, the restaurant feels a bit like the inside of a cruise. Chips and edamame are served at the start of the meal. The chips are homemade using organic potatoes. My friend found them a bit too oily. Some pieces were very crispy, and others were slightly soggy. As mentioned before, restaurant week lunch is $24.07 for a 3 course lunch, and $35 for dinner. Salmon Tartare: with creamy horseradish, salmone roe, and dill. Not the best salmon tartare I've had, but it was decent. The bread was dense and on the harder side, which was perfect for holding clumps of the tartare. Crispy Shrimp Tempura: with spicy mayo, sesame seeds, and chives. This was hot, freshly fried, and full of flavor. Each piece was the perfect bite size, and the spicy mayo gave it a great kick. 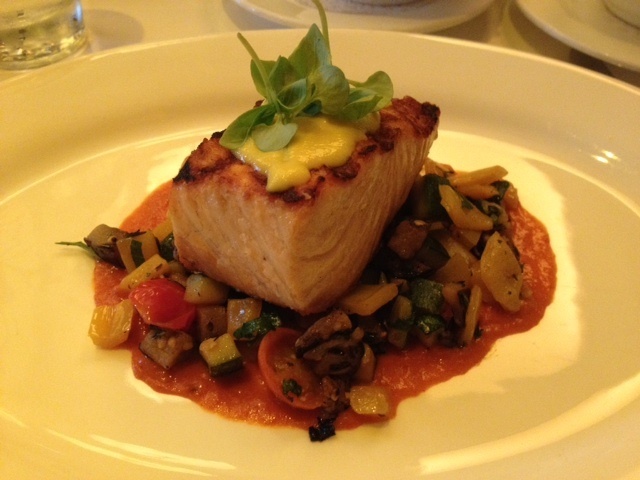 Grilled Salmon: with ratatouille, bell pepper coulis, corn pudding, and basil. Even though I always try to order something different from whoever I'm eating with, I'm so glad we both ordered this because every single bite was incredible. This was quite possibly the best salmon I've ever had. So tender and moist, and complemented by fresh vegetables that helped bring out the salmon flavor. 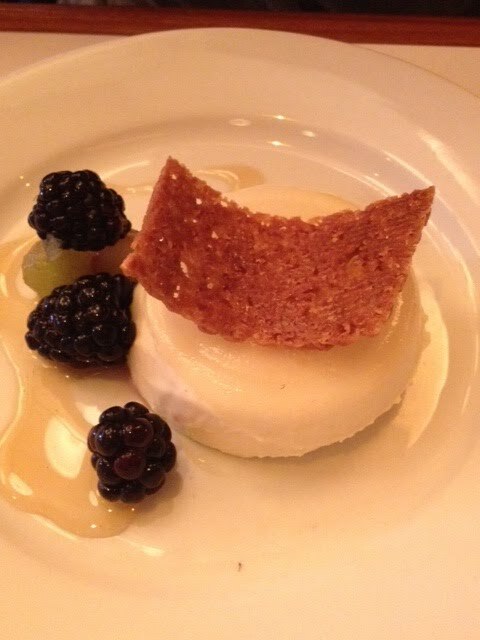 Lavender Yogurt Panna Cotta: with almond crisp, honey syrup, and blackberries. This dessert had a very strong lavender flavor, and I don't think I'd order a lavender flavored dessert again. It reminds me too much of potpourri, which is great for smelling, but not so much for eating. 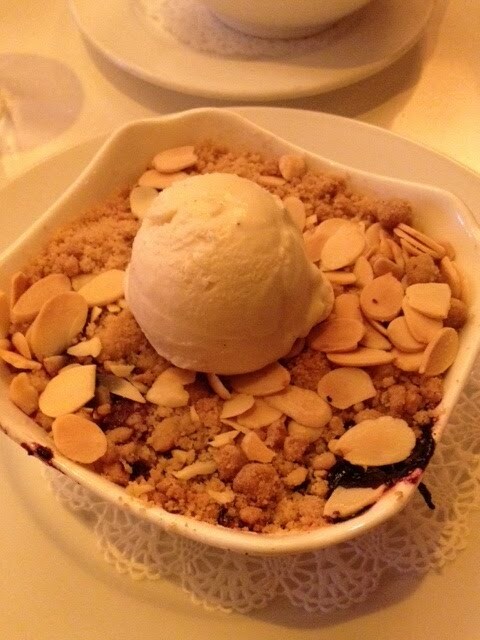 Blueberry Almond Crumble with Vanilla Ice Cream. Such a memorable dessert. The ice cream went beautifully with the tartness of the blueberries. The almonds and crumble brought in more neutral flavors, and topped off the dessert as a whole. I would definitely return just for this dessert. I have to mention that our server was very warm and so great at checking on us a few minutes after each course was served. This was even after the restaurant filled up and all the servers were noticeably busy taking care of many tables. Every course was also served very promptly, and we were able to sit down, enjoy all three courses and finish up within an hour. Definitely try out Lure Fishbar even if you only have time for a quick lunch!